Blade length :　57.8cm or 22.75 inches. Sori : 1.0cm or 0.39 inches. Width at the Kissaki : 2.17cm or 0.85 inches. Kasane : 0.61 cm or 2.4 inches. Shape : This blade is wide and thick, has Bohi carved into the both sides. Jigane : Well grained Koitame-hada has Jinie attached. it’s very beautiful clear. Hamon : Nie-deki, Suguha mixed with Notare, deep Nioikuchi, Boshi is round. Special Feature : Yasutugu, the son of Yasusada, was born in Echizen province but moved to Edo later on. His style, namely signature and Ysurime, are very similar to his father’s. Saya : Black Urushi saya. Tsuba : Round shaped Tsuba made of Shakudo, that has the flower and plants design carved into. the signature reads Bushu ju Toshiyuki, August Bunsei 2nd. Menuki : Gold color mushroom design. Fuchikashira : made of Shakudo Nanakoji, the flower design carved into. 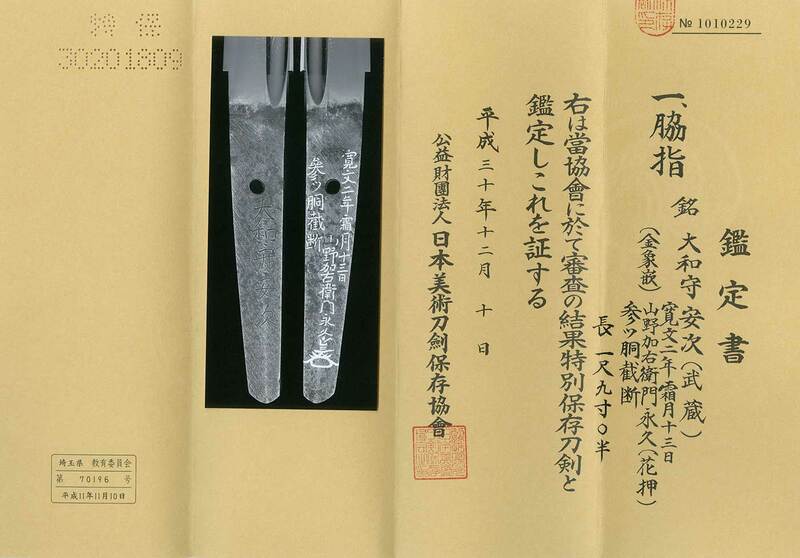 Special Feature : The inscription says Yamano Kauemon tested this sword on 13th November 1662 and the sword cut 3 bodies. It’s said that Toyotomi Hideyoshi’s servant started the cutting test practice, and his pupil, Yamano Kauemon, was appointed as the tester. The result of the test is inscribed with gold inlay, and only high ranking people could afford to do.